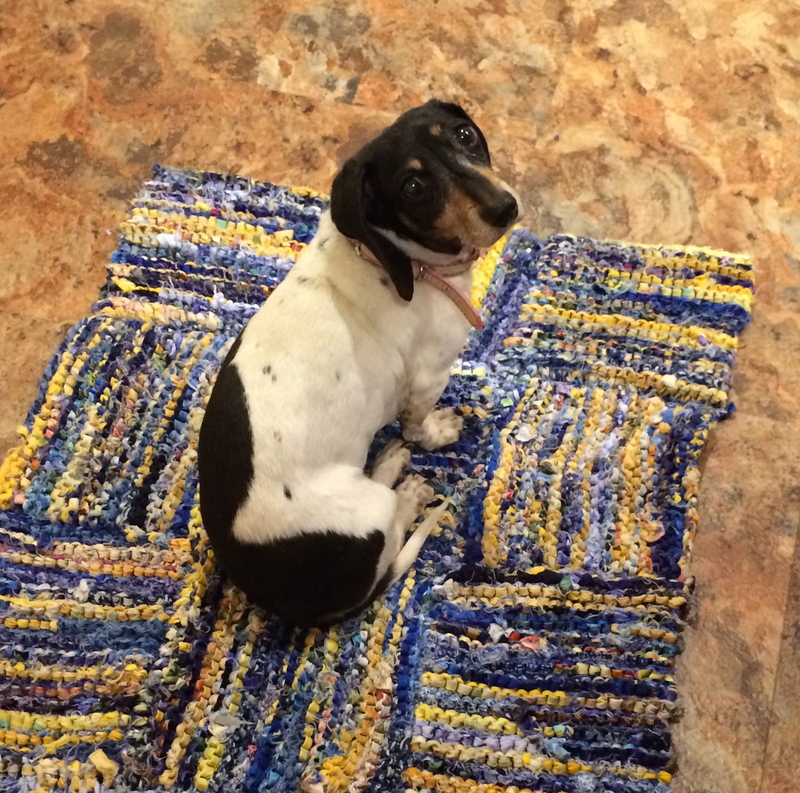 I had a wonderful week at Cambria Pines Rug Hooking Camp! First of all, Cambria itself is a wonderful place. Cambria is near the sea, with moderate temperatures, and is a quaint little town. Cambria Pines Lodge is a wonderful place to stay. 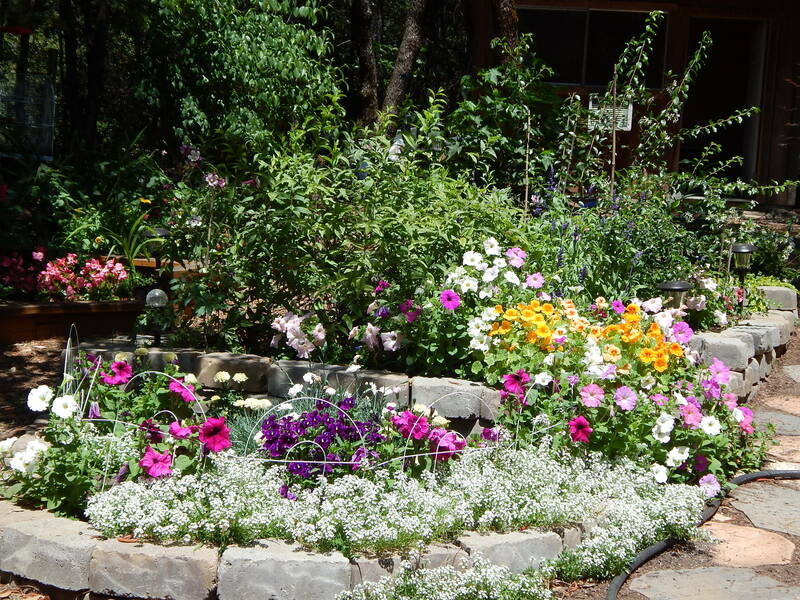 Its a huge complex, with wonderful gardens surrounding the lodge, comfortable rooms, and delicious food. 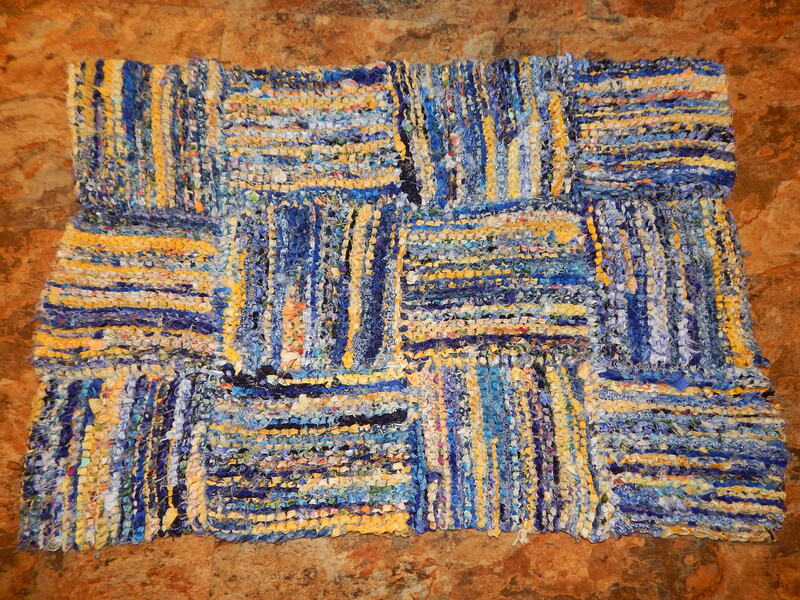 I had Gene Shepherd as my teacher, and since he had worked with me on this rug when I started it, he gave me just the right amount of guidance. 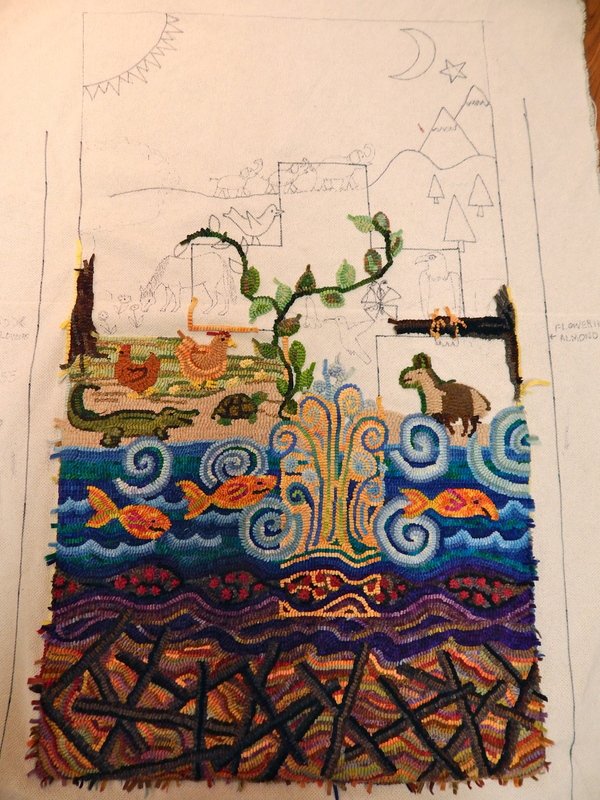 One of my main questions was, do you think I need to add more “creation”, that is, more plants and/or animals? As you can see from this picture taken before I left, my drawing skills are minimal. I get very intimidated when I think about drawing animals. But I have to tell you, Google Image is the way to go! It was just amazing. I took my Kindle Fire with me, and thank goodness they had WiFi there. I would type in “crocodile images” and there would pop up the perfect crocodile. Many times the first image that came up was just what I wanted. So I got the crocodile and the turtle done the first day. 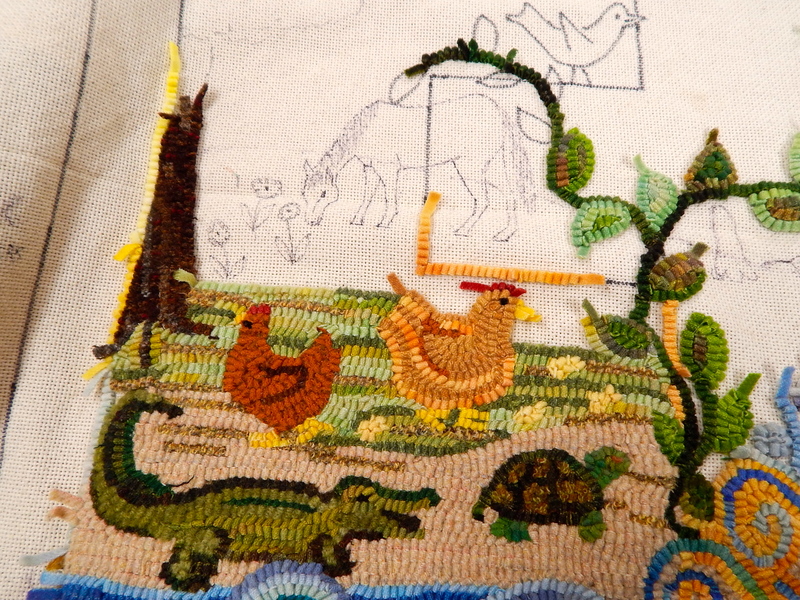 I added a tree to the left border (tree trunk visible here) and I knew I wanted to add some chickens. Trouble was, I wanted to put them right where that stick horse was. Gene suggested drawing them on paper, and then tracing that over the horse image. That worked just fine. I got the chickens added in the second day. The horse was a major topic of conversation, as American Pharaoh had just won the Triple Crown, and also my table-mate was a horse lover. And also, I did not think I could draw a horse at all! Google images to the rescue! I found an image of a horse grazing, and I liked that. I am pretty proud that I was able to draw a horse this well! 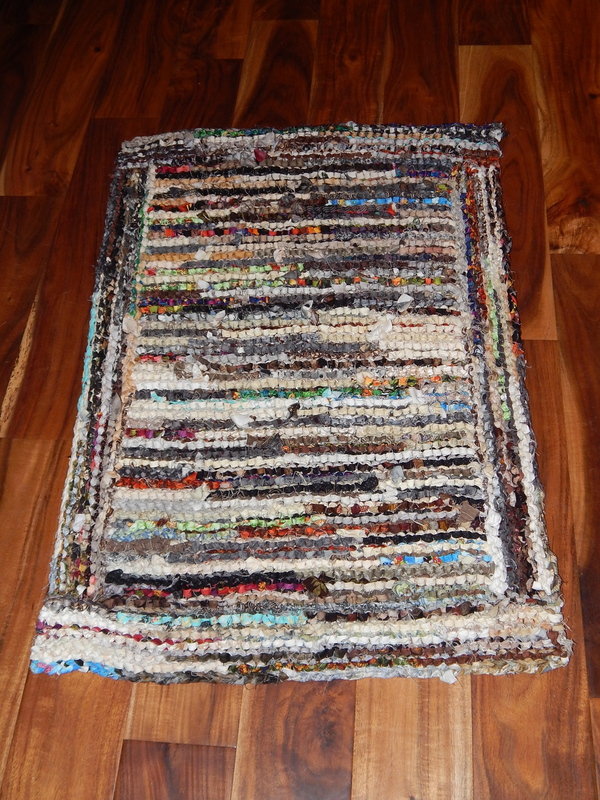 Here you can see the whole rug, and all the images I added to it. I actually drew the elephants in the first day, as I was pretty certain of my elephant drawing skills 🙂 When I googled “chicken images,” they had a little bar that said “you might be interested in these images,” and they showed a bald eagle and a hummingbird. Why yes, I was VERY interested in those images. I drew in a dead branch coming in from the right side for the bald eagle to sit on, and added some trumpet flowers to the vine, so the hummingbird would have something to drink from. The butterfly will be eliminated. One of the things that is the most difficult for me is getting the right contrast. The color I had chosen for the “sand” was too close in value to the croc and the turtle, so I had to find a different sand color. Also, although I want the cross to stay in the background (like a watermark,) I do want it to be visible, so I will have to be aware of that as I continue to hook . 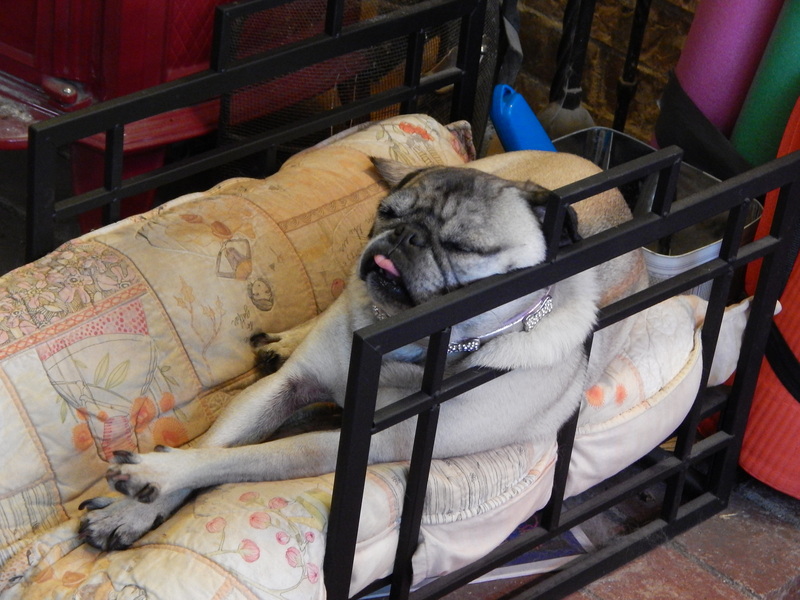 All this thinking is very tiring to me. I remind myself that this is an important part of the creative process. I hooked and drew and pondered value each day during the class hours, from 9-12, and after lunch from 1-3:30. I did not stay after class or hook into the evening hours like many of my classmates. And that made the entire trip very enjoyable for me. 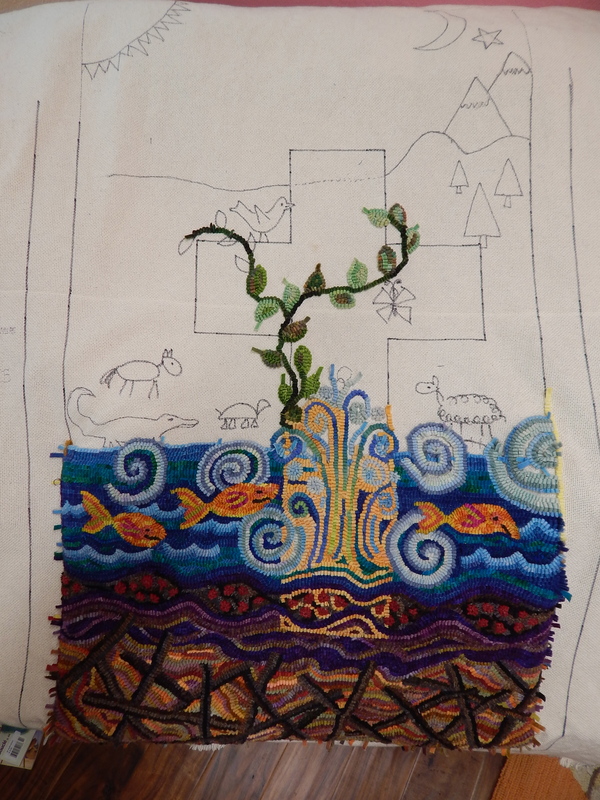 I returned home refreshed, and to be honest, anxious to return to my quilting! 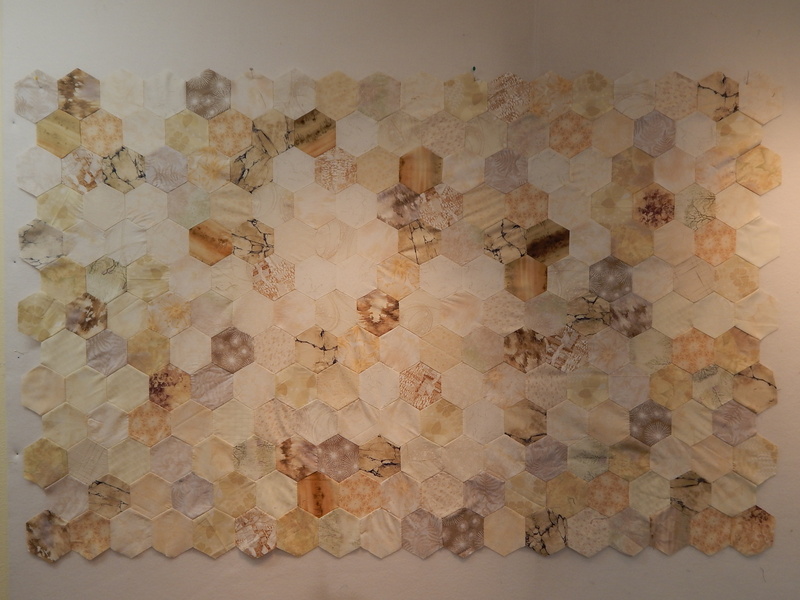 Somewhere, someplace, I saw a quilt that used hexagons as a background. I really like that idea, and I had the thought that I would like to use bigger hexagons. I have done quite a lot with small paper pieced hexagons, and although I like them, they are pretty labor-intensive, and hard on my hands. I thought that bigger ones, without the paper, might be easier to work on. Plus, to be honest, I thought it might give me an excuse to get that Accuquilt that occasionally calls my name. So I discussed with my BF (who already has an Accuquilt and thinks it is the BEST NEW TOY ever 🙂 ) I said, well, I should find a template and see if I even enjoy piecing the hexagons before I invest in an Accuquilt. And just like a good BF, she jumped at the chance to send me some pre-cut hexagons. Because, hey, she has a little extra fabric and an Accuquilt. Like in one day, my little pack of hexagons arrived. Included was a cardboard template of the hexagon. It is the hexagon with 2″ sides, which makes it about 5-6 inches across. Oh yeah. This size is JUST RIGHT for my hands. I love hand piecing, especially when you are making something that just cannot be done easily by machine. And because my friend had included the cardboard template, before my first night of stitching was over I was in the studio adding more hexagons to my little pile. And I remembered how much I like drawing around a template and then cutting the pieces out with scissors. Yay! Kindergarten for adults 🙂 Bye-bye, Accuquilt. I do not need you now. But if any of you have ever worked with hexagons, you know they have a mind of their own. Its just very hard to know which direction you are going in. It starts to develop this weird amorphous shape. So I came up with a solution. 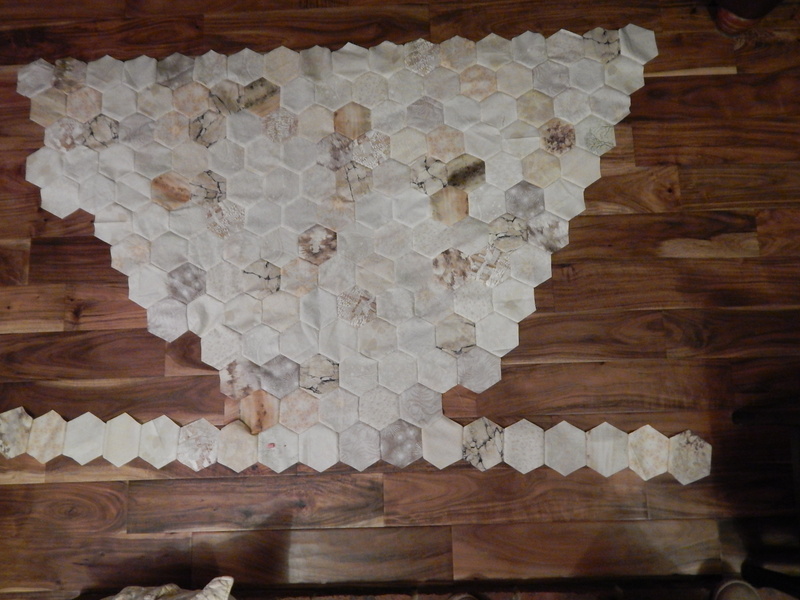 I laid it out on the floor, and decided how big I wanted it to be, and then defined the two sides with lines of hexagons stitched in place. I thought this was very clever. And now I am having much fun filling in the empty spaces. I do not remember what my original idea was, but this will be a very fun blank canvas to work on, once the muse gives me an idea. And because I did not have many pictures to share with you today, here is a picture of Bess, reveling in the warmth of the wood stove.